Husband: K. be home in 15. After texting his wife, husband drives home with the thought of digging into a big bowl of creamy/carb dense spaghetti with mushrooms & a full glass of wine. When husband walks up to the kitchen table, he looks deflated after realizing he’s been duped AGAIN with spaghetti squash! Why does his wife always try to pull a fast one? Doesn’t she know he’s not vegetarian? Knowing this might be the case, wife plans ahead and makes a small batch of garlic bread to compensate for the lack of carbs. Turns out husband (a carb lover who doesn’t love mushrooms) actually enjoys this Roasted Spaghetti Squash with Mushrooms recipe. Wife is satisfied with the dinner she concocted and is happy she is able get a huge bowl of vegetables into her husband’s belly. Good wives know that the key to a man’s heart is through garlic bread. 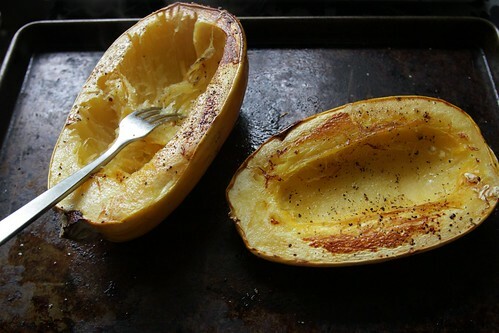 Roast a spaghetti squash. It’s easy! Now let’s enhance it. Gather your ingredients. Golden raisins make an appearance. If you don’t like raisins, don’t use them! 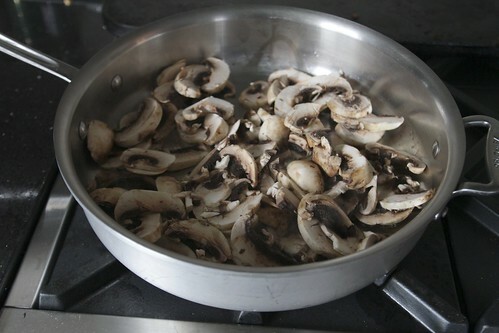 Get the shrooms in a pan. Brown those shrooms! Add in crushed red pepper flakes & garlic. 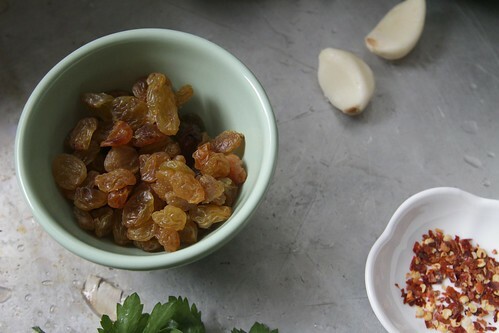 Cook for a minute, then add in your golden raisins. Put the lid on! Shred the squash. Instant spaghetti. 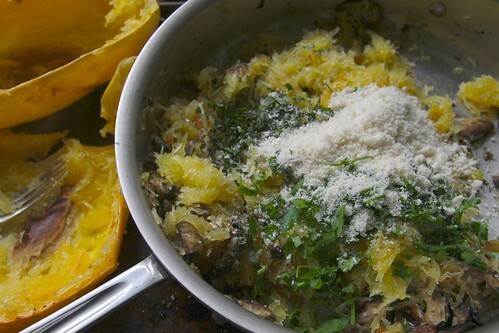 Add the herbs & Parmesan to the squash & mushroom mixture. STIR. Put some on a plate. Add a lil extra parsley & Parm on top. You should eat some garlic bread. You know…to balance things out. Preheat oven to 400F. Rub spaghetti squash halves with 1 tablespoon olive oil, sprinkle with salt & pepper and place on a baking sheet cut side up. Roast for 30 minutes, flip squash and roast for another 30 minutes, or until tender. Meanwhile, heat 2 tablespoons olive oil in a medium saucepan over medium high heat. 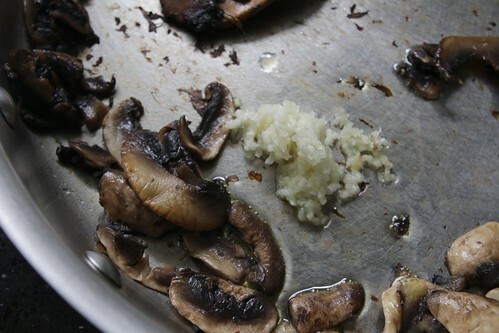 Add the mushrooms and cook, stirring occasionally til brown, 5-6 minutes. Add a pinch of red pepper flakes and garlic, cooking for about a minute. 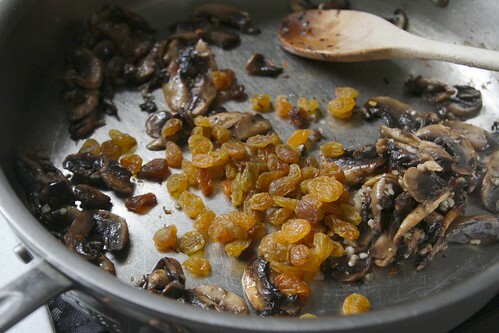 Turn the heat off, add the golden raisins to the pan and cover with a lid. When the spaghetti squash is done, let cool for 5 minutes. 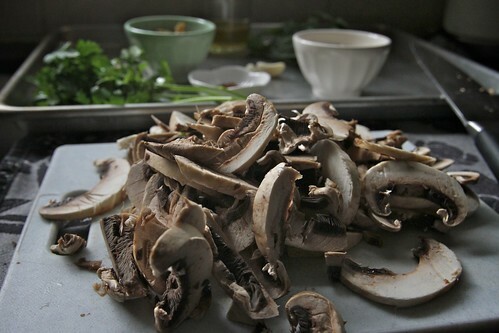 With a fork, shred the meat of the squash and place it directly into the pan of mushrooms. 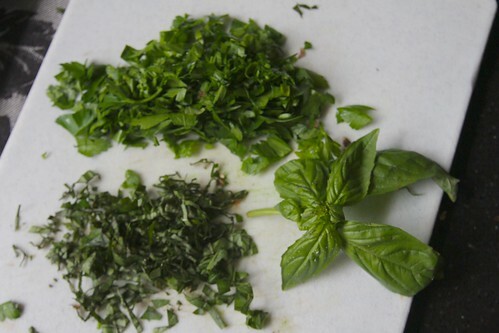 Add the Parmesan, parsley, basil, and remaining tablespoon of olive oil. Stir well to combine. Season with salt & pepper and serve. Why haven’t I baked spaghetti before? I am too Italian, too traditional, I have to start thinking out-of-the-box more! Love the recipe and the final result looks yummi, extra yummi! You are one clever wife! I love it! I might need to add some bacon to sneak it past my boyfriend but it looks wonderful! So creative! This looks great. The only squash they seem to have in Japan is buttercup…which is great, but I sure miss spaghetti and the other varieties! 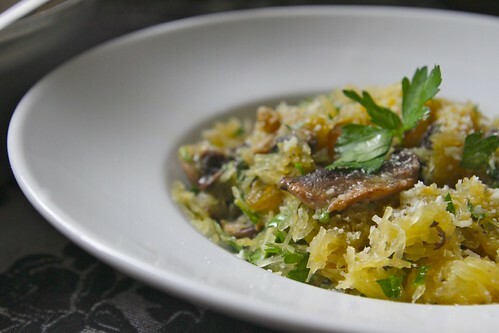 Spaghetti squash is so magical! this looks amazing. Hahaha I pull the fast one on my man all the time. This dish is my kind girl food. Love it! definitely gonna make this one! maybe even today. it looks delicious! that story is so me and john! clever lady! I love it when I trick my husband into eating something he thinks he won’t like…I always give myself a mental high-five and sometimes make him actually high-five me. 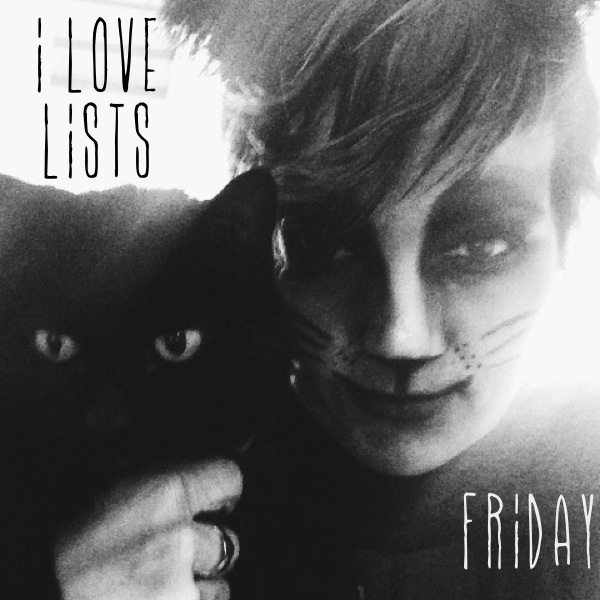 you totes deserve to be fived for this one! Stupid question, but when you say “flip squash” you mean you put them cut side down for the second 30 minutes, right? Holy Mother of God, that looks awesome! 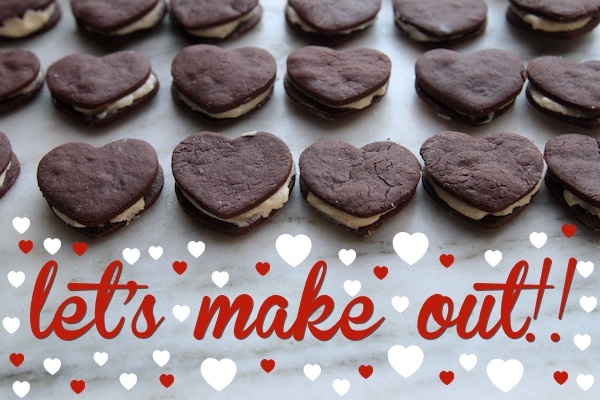 It’s paleo (kinda)…I’m making it. I trick my husband all the time into not eating meat and eating tons of veggies. But I never lie to him, I always tell him, it’s his fault he doesn’t listen lol. Oh husbands and their aversion to healthy food! My husband is generally skeptical when I cook vegetarian for him too–but I always come through! I’m surprised about the texting since you said on the podcast that he generally doesn’t. Do you watch Tough Love Miami? Well the host guy Steve says men use text messaging for logistics, and usually that’s about it! YOur husband’s texting to find out about dinner made me think of that! This looks amazing, Tracy! I can’t wait to make it. Gotta love that spaghetti squash! Can’t wait to make this recipe. I love using spaghetti squash instead of pasta every once and a while. It’s so versatile. And although you might be missing the pasta in this dish, you certainly are not missing flavour! This looks so good! I’ve never made spaghetti squash, but if it can make your carb-loving husband a fan thenI know I’d love it. Whoa x infinity. I’m officially really hungry. Sooo, I’ve been having a kind of bummer of an afternoon. Then I read your post. I remembered I have boomers in the kitchen. I’m now so jazzed for tomorrow, just for the cookin’ and the eatin’. Thanks. I’m so going to make this, Tracy! I haven’t had spaghetti squash in ages (though I always seem to buy other squash). Bookmarked! YUM. Just saw your tweet about this…my vegetarian sister’s husband is a paleo guy, so I will share this with her! The parmesan technically makes it not paleo, but obviously she can just add it to her plate and not the whole dish. He’d probably eat this as a side with meat! Oh yeah, and I want this, too! Yeah! I just realized that. WOOOOPS. It would still be good w/o Parm. 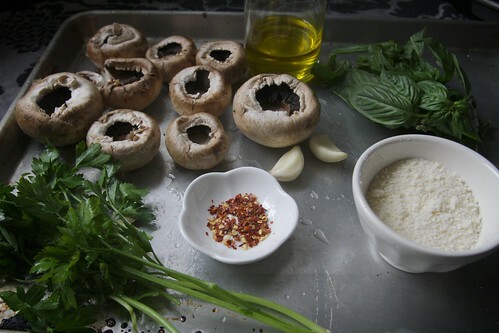 I should try this dish because 1) it looks and sounds delicious and 2) my husband hates veggies and especially mushrooms but if it worked for yours, it might work on mine!! You could always make without the shrooms and add butter. It’s super good that way. Butter is always good and he wouldn’t definitely go for that. Thanks for the suggestion! Looks great! I’ve always been hesitant about spaghetti squash, but I think I may have to take the plunge! The flavors look amazing and it’s healthy, too. Oooh, you could add toasted pine nuts to this for protein, too. This sounds really yummy! I have a spaghetti squash on my shelf just waiting to to be made into something amazing, I may have to give this a go. I just stumbled and found your blog the other day. I have been following joy the baker for some time and saw her link to you. I absolutely love your blog and recipes. I totally saw the one about the cleanse and I am going to give that a try. I love how you were very detailed with the whole process. I am a bit nervous to try it as I have an 11 year old who watches everything I eat and there will be questions! Have you tried Juice to You? They are located in SF and they do cleanses as well. 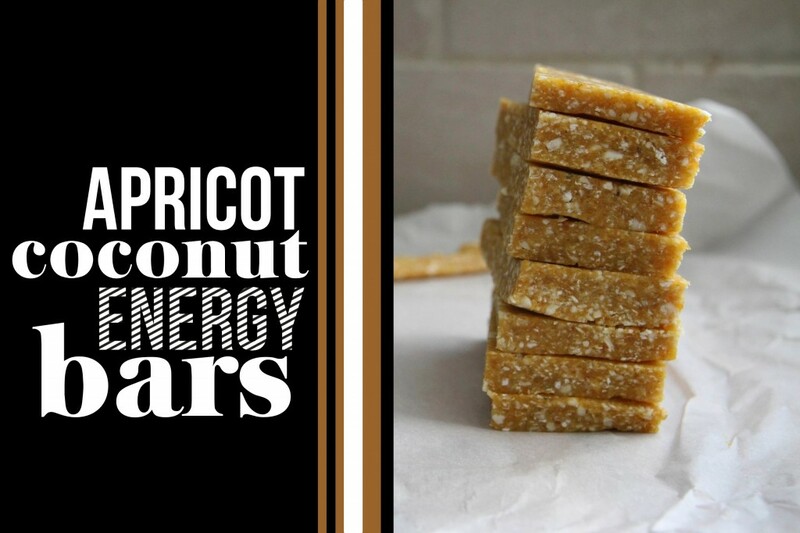 I love this recipe and plan on making it this weekend. We love pasta dishes in my house! this looks amazing. i might exclude the raisins if i tried it. thanks for the recipe 🙂 I’m sure even my picky, steak loving bf would like it! I’m soooo going to pull this one on my husband, even though I’m pretty sure how it will end up. Him with a frozen pizza and me with the rest. That works for me. oh, i love the addition of the golden raisins! 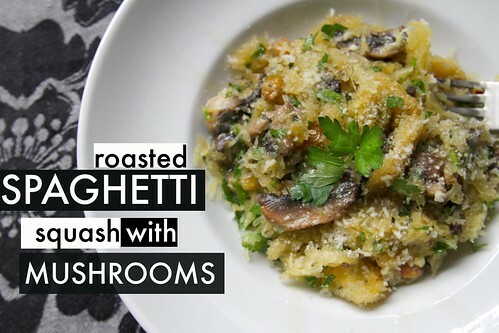 very sneaky and perfect with the mushrooms! I made SS tonight for the hubs and he loved it. I am vegetarian and he is not but he eats vegetarian at home for every meal. SS is so YUMMY! My Hubs loves him some veggies. I just bought everything yesterday to make this recipe today, and I cannot wait! I’ll probably eat it the next day for breakfast and lunch, too. 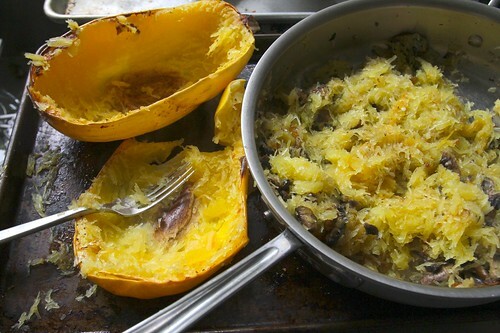 Spaghetti squash is underrated! This looks incredible! I don’t eat dairy, but I bet if I substituted some toasted panko bread crumbs with garlic it would still be crazy good. 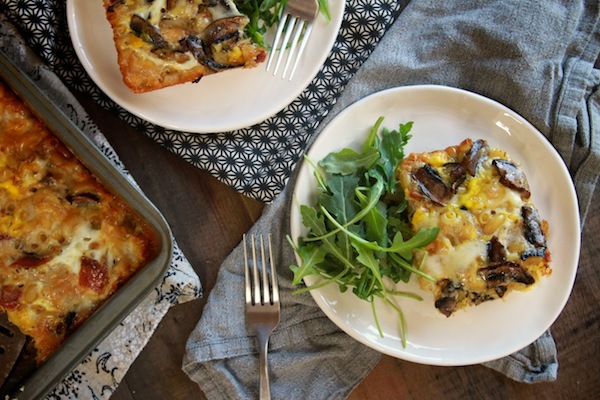 Spaghetti squash is definitely on the menu this weekend! There is no way I could get this one over on my “man friend”… he is super bonkers when it comes to shrooms. But this will be a healthy happy single girl dinner for me very soon! Ahh dang. 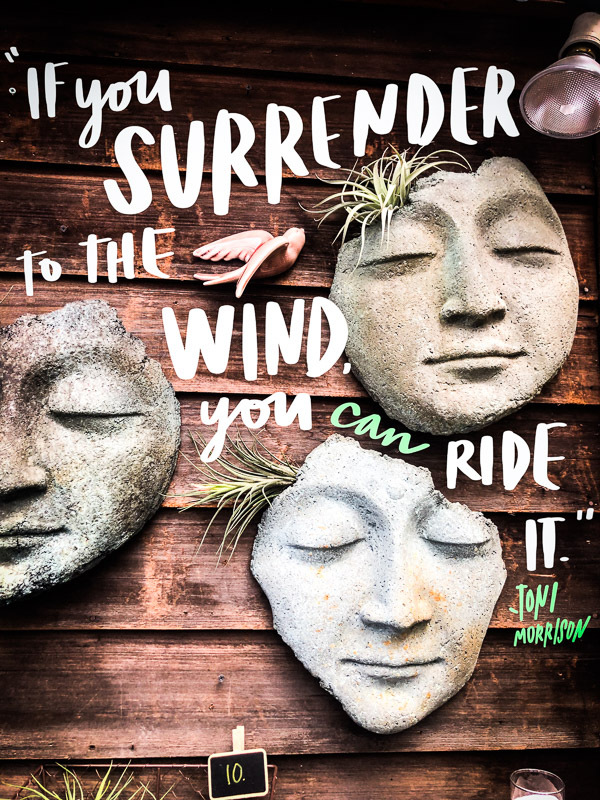 You can always make it without! Add some meatballs and pasta sauce. MAN FOOD! 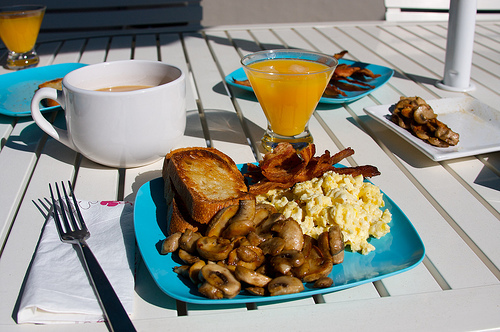 My boyfriend and I love eating vegetarian food. He’s more of a health freak than I am, definitely. So I’m totally going to try this out on him! Thanks for the recipe Tracy! i made this last night…FANTASTIC!!!! thanks shutterbean…! My husband thankfully like spaghetti squash, but he doesn’t view it as spaghetti replacement so much as half of dinner. The other half is made up of something protein/carb heavy. I’ve taught him to classify his meals by food groups – half should be veggie. So it’s good that he’s trained (;p) but bad that he lumps this dish into just a vegetable side. Hehe. 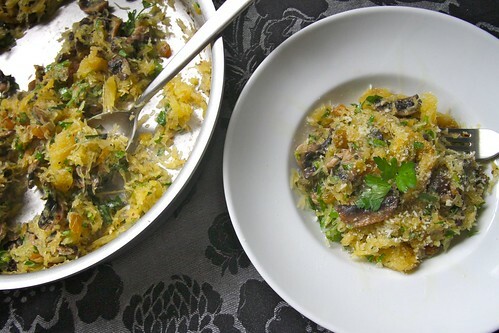 I love spaghetti squash and am always looking for new ways to make it! This looks so flavorful and delis! I can’t get Randy to eat spaghetti squash. Maybe it’s because the couple of times I did try to make it, I undercooked it. Even I will admit it was not good. So even if I mention it he makes a face. I’m going to try again! we just finished eating this along with some green beans sauteed with garlic–super good–thanks, tracy! i just made spaghetti squash a few weeks ago and it reminded me how much i like it. this is FOR SURE going into my “ones to try” file. Mmmm…..
wowsa. double wowsa. I made this tonight and could not stop eating it! Thanks so much for the recipe – I only used 1/2 the squash so will be running out to buy more ‘shrooms so I can do it w/ the other half tomorrow. the golden raisins are the key I think. just the right hint of sweet in this oh-so-savory dish. keep it coming!!! Awesome, Karmen! I’m so glad you enjoyed it!!! I have all the ingredients in the fridge! I can’t wait to try this one. I’ve made this twice now and enjoy it more each time. such a great, filling, TASTY main dish for us veggie-types, and easy enough to serve alongside clucking things for my omnivore friends. another great recipe, tracy! thank you! Okay… I know this is supposed to be veg-friendly, but I strayed. I used both cremini and shitake mushrooms as well as pancetta. Someone also left some frozen stuffed mushrooms in my freezer, so I used those too. As well as some Tabasco spicy teriyaki sauce (just a few dashes). SO TASTY! I’m going to have to write this down and make it again. Thank you for the inspiration! Love the blog. Love the podcast. How did you cut your squash in half? My wrists hurt just looking at it. Thanks! I made this for dinner tonight and it was AWESOME! Thanks for the fantastic recipe! I used to work a Houston’s and we had a recipe similar to this an I was hoping this would recreate it…sure enough it tasted the same if not better (I’m a bit biased but I made it). My boyfriend was scratching his head when I brought home and cut open the squash…he specifically said “how are you going to make spaghetti out of that?” couldn’t help but get a good kick out of his reaction when he went back for thirds!!! It was fantastic!! Thanks for the recipe, it’s nice to see recipes where it’s not used as a pasta substitute because it’s so delicious with a few ingredients! YESSS!!! I was soo addicted to that dish that I had to recreate it! I’m still working on perfecting the kale salad they have right now. Hmm what to do when you are craving this dish but quickly realized that all the basil froze in the first frost last night?! My sage and parsley survived….think that will work ok? sage & parsley would be great too! add some nuts! make it hearty. Oh great idea! Kale salad with pomegranate vinaigrette on the side. Thank you – this will be a great date night in!!! SO SO DELISH! I added onion and red pepper, plus extra parsley and basil. Yum yum yum yum! How does this freeze? There’s a lot of liquid and I’d hate to ruin such a wonderful dish. I’m not sure but I’m pretty sure it would have a lot of liquid. I’ve included a link to this recipe from my blog (Beyond Zucchini). Loved it! I did it the lazy man’s style and didn’t add any herbs, pepper or raisins. Hi – In Norway it is impossible to find Spaghetti squash. So we planted some, but too late I am afraid. Summer is over. I tried helping the small Spaghettisquashes off the ground, and one broke off. It weighs 330 grams. Anyone know if this is an OK size to eat? 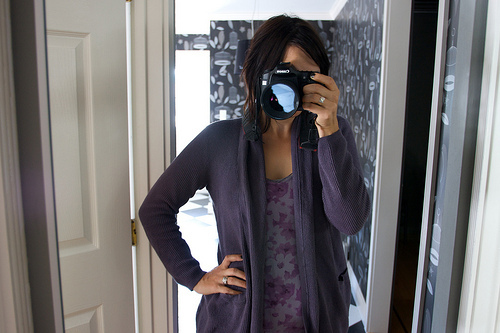 I bought a SS today and went right to your blog and found this recipe – it looked sooo good! I added 1/4 lb of Italian sausage (browned in skillet before mushrooms) and it is really good! Thank you! It’s super good with sausage! I’m gonna have to make up another recipe. YAY! It was really good with the italian sausage but I think a sausage with a stronger fennel flavor would definitely boost the flavor, just sayin’…! I just found this recipe yesterday and made it for dinner last night. I was skeptical about adding the raisins at first, but it it came out delicious!! I should never have doubted. Thanks for the great recipe!